We are open for choose and cutters! We have about one foot of snow on the ground so please come prepared to walk in deep(ish) snow. There is a light dusting on the trees but it easily shakes off. Come and visit us in Craftsbury to pick out your Christmas tree. We have over 8000 trees on our choose and cut property and we specialize in larger trees (8+ feet). Many people and families have made it a holiday tradition to come to our farm, walk the land, and select their perfect tree. Stay for five minutes or five hours…it’s up to you! Pre-tagging a tree: You're welcome to come early in the season to pre-tag a tree! Some people find it more convenient to select a tree before the snow flies. Bring ribbon with your name clearly marked on it in several places. If we're around, we're happy to give you some ribbon to do so. Be sure to wrap the tree many times so that it's very obvious you've pre-tagged the tree. We do ask that you only mark one tree unless, of course, you intend to buy more than one! Please refer to the pictures for suggested ways of marking your ribbon and tree. We do have some trees tagged in the choose and cut section which we have tagged with single, small ribbons, for possible wholesale. Feel free to select those trees for yourself. The ribbons are blue, white with yellow polka dots, blue striped, and solid yellow. Unless a tree is very obviously tagged with someone's name on it, it's up for grabs! We are a dog-friendly farm, but we ask that you keep your dog on a leash for the safety of others. Hours of operation: We’re open from dawn to dusk starting the day after Thanksgiving; most people come between 10-4. We're happy to bale your tree for travel if needed; if it's necessary that your tree be wrapped, it's best to come on a weekend or between the hours of 10-4 so we're nearby. We can also provide twine and our tips for you to load your tree securely on top of your vehicle. Which type of tree should I get? Well, that depends on what you consider important in a Christmas tree. Balsam and Fraser fir look quite similar; in fact, they are genetically related. Fraser are considered 'southern balsam' and are more often grown and sold in southern Appalachia. 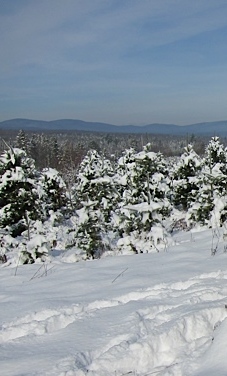 Balsam fir are more associated with northern climates. The main differences are that balsam tend to be much more aromatic and Fraser fir are known for their good needle retention. So, the choice is yours: nice smell or fewer needles! We also sell our own maple syrup and wreaths at our choose and cut shack. Come early for best selection. Call Steve or Sharon at (802) 586-6900 if you have any questions.